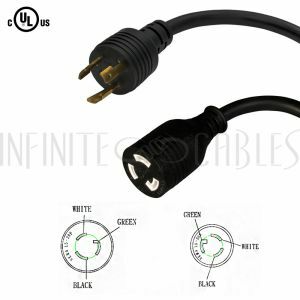 This power cord consists of a L5-20P male on one end and a L5-20R female on the other end. It is typically used as an extension cable. These cables are constructed with UL mandated inner plastic frame molds to enhance terminal alignment and produce a high quality connector. The connectors premium quality ensures a snug fit with receptacles. Each assembly is 100% continuity tested and 100% HVT (High Voltage) tested and inspected before shipping.